Do organizations purchase their solid-state/flash storage technology through resellers or directly from vendors? According to our survey, customers were almost split in this regard. 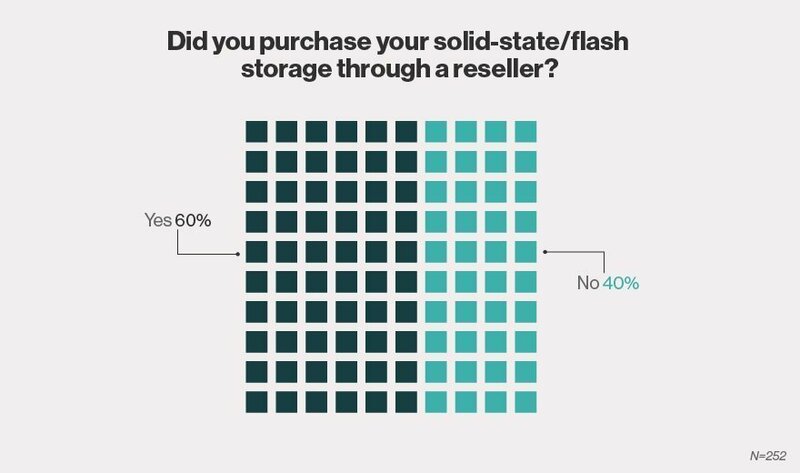 The majority of tech buyers (60%) said they purchased their technology through resellers, while 40% said they bought directly from solid-state/flash storage vendors. One of the competitive advantages that resellers potentially have over vendors is an ability to provide customers with greater support. Most likely, resellers and solid-state/flash storage vendors are going to succeed in the initial implementation equally well, Crump said; but a reseller might be more available for a customer than a vendor if there's a problem with the technology six months later. Crump pointed out that there's an opportunity for resellers to potentially create their own flash storage option. "They can leverage software-defined storage and deliver it turnkey to a customer," he said, adding that doing this requires some technical expertise, as well as the abilities to offer your own support and source the various components. Beyond this, resellers can compete by identifying a solid-state/flash storage product that is truly differentiated, since flash technology makes many of the systems look similar, he said. Get tips for selling storage into virtualized environments. Watch this video about the benefits of deduplication and compression. Take a look at this guide to enterprise all-flash storage arrays. Does the IT channel struggle against the direct sales forces of vendors in the storage space?